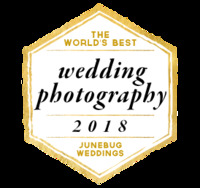 Click the icon to check out our feature on Junebug Weddings! To me, your wedding day is collection of the moments in between - the true relationship between the two of you and the people that love you. I will keep you on track while letting your day develop. I’ll share your excitement, while being a presence of calmness. I will do my absolute best to add value to your day by reminding you to take a moment, don’ stress, and breathe it all in. I believe my biggest strength is making people feel comfortable, relaxed, composed and most importantly feeling like YOURSELF. I know that if you both feel like yourself, and feel natural, that is when you will be emotionally connect to these special photos. I am madly in love with what I do and it brings me so much joy to be able to share this passion with others. I am so grateful to my clients and couples that allow me to artfully capture this incredible time in their lives.